When the trend to vintage campers, boler trailers, airstreams, teardrops and more became the fun thing I knew it was only a matter of time till people restoring the retro camping gems would shift their focus to collecting all the decorator goodies to make their look complete inside and out. I started stock piling Melmac almost 10 years back filling bin after bin as friends thought I was crazy. By the time the hot retro trend showed up I was ready with wonderful collections and near full sets collected a piece at a time. 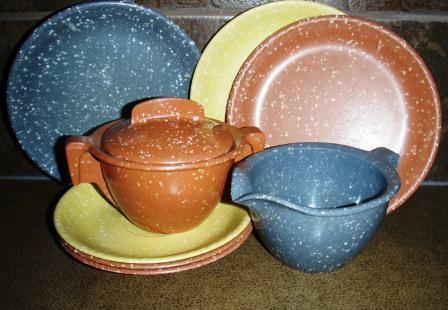 In the summer of 2009 I packaged it in delightful groupings and I sold it as fast as I stocked my antique store shelves with this colorful dishware. My online stores still feature a great selection although it is getting harder and harder to find first hand and the prices have skyrocketed. Melmac will be one of those items I am happy to say I was ahead of the trend on! With a history back to the 1930’s the use of melamine particles to produce hard plastics has led to decades of popularity for what became trademarked Melmac household dishware. Many manufacturers produced melamine products but the Melmac brand carried the highest standards and quality control. By the 1970’s it declined in popularity as Melmac was limiting to modern kitchens and was slowly replaced with stone and earthenware that could go from the freezer to the microwave or oven, and then into the dishwasher. In its heyday hardly a magazine household advertisement or full spread decorating feature was complete without some version of Melmac featured in the images of life back in the day. It is fun to thumb through vintage magazines and old catalogues and discover the many patterns and displays of Melmac. For your best collecting value look to find only those pieces clearly marked MELMAC on the bottom. Prices go from the pennies to the hundreds so know your market and whether reselling or reusing enjoy your collecting! 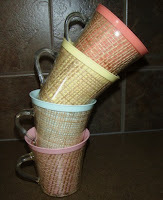 hard to find the rattan wicker lined melmac is so retro! comments welcome here on the blog! now you can READ all ABOUT IT! 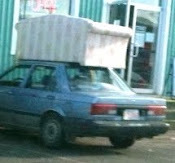 Visit Thrifty's profile on Pinterest. I snapped this pic infront of a thrift store! ALL CONTENT copyright Michelle Greysen. usage permissions needed to copy or link contact author ... Travel theme. Theme images by Sookhee Lee. Powered by Blogger.